There seems to be a wonderful link between love, God, birds and our eternal souls.. We tend to accept that birds are God’s messengers; well it is very clear from old stories such as the one about Noah in the Bible. Birds do not tire themselves unnecessarily by flapping their wings in the skies – they let the wind carry them, sometimes for very very long periods of times. We need to be doing the same – not fighting the flow of life, but letting it lift us up and carry us to our destination! 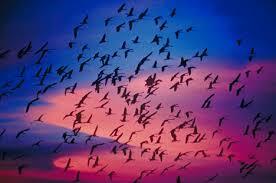 Birds are wise, they know the wind will take them wherever they need to go and they do not question it. They do not stop and ask for directions or change direction or their minds! They just KNOW, from the moment they are born that there is a plan in place for them. They have no free will, no insecurities.. And you know what, they are free. They could go wherever they want, become what they want – but they know that the only thing they must/can/should BE is a bird and the only place they must/should/can DO is to go where their Creator wants them to go. This is because they do not question it because as birds they do not have the choice – however we as human beings we do. And we make choices based on illusion, past fears and hurts and future needs and wants and projections. If you had wings then where would you go? If there was a place in the world you wanted to be, then would you not just go there? Spread your wings and fly there? If you were really a bird, really free, and you FELT that connection to your purpose, then you would not need to ask yourself what, where or why. There would be no doubt. Because you would JUST KNOW. You would hear that inner call and you would never ever doubt it. If we were birds then we would already be where we wanted to be because we would have taken the shortest way there – no questions, just acceptance and knowing. Why don’t we just follow the signs like the birds do – the wind, the stars, the sun, our instincts, the magnetic pulse of the earth.. the small voice of our heart? Why can we not just do what we are supposed to do because that is where the love and the peace of mind are? I guess we are so disconnected from it… Because if we were connected, we would see that even the birds themselves are trying to tell us this! 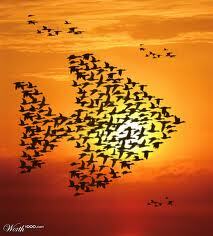 Have you ever noticed how birds migrating in groups (another wonderful miracle of life!) always fly in the form of an arrow? It’s like they are showing the others the way, they are saying “Come with us, we are going!! !”, just in case the others forgot what the perfect plan is. I think this is what I felt and still feel, about you… I want to so much just to take off and soar with you!! To let the winds gently take us where we need to be 🙂 I know in my heart that if we were birds we would be together… Because we are of the same kind, and wherever God wants you to go is also where God wants me to be. Simple as that. This entry was posted in True Love, Twin flames and tagged Birds, Birds as messengers of God, Flying, flying high, Following our heart, Following the divine plan, free will, freedom, perfect plan, soul mates, spiritual awakening, true love, twin flames, Will of God. Bookmark the permalink.